Speak Lord! I need to hear you right now because I don't know the answer to this problem!! Have you ever prayed a prayer like that? Usually after a prayer like this one there is a time of resentment or anger where we wonder where God is in the midst of our difficulty. Why won't you speak Lord? Why are you so quiet? "Remember, that the teacher is always quiet during the test." 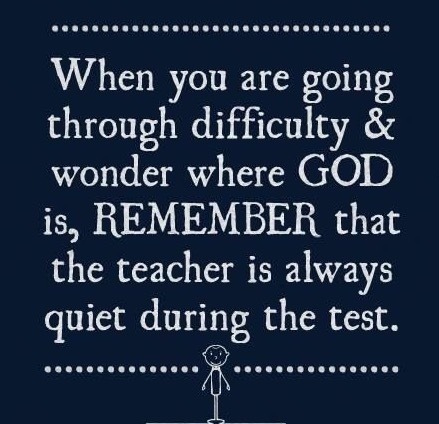 When you don't hear His voice, you are in the midst of a test. Keep calling out to the Lord and drawing close to Him. You are going to gain strength and confidence because the purpose of any test from the Lord is to get closer to us. As we attempt to get closer to Him He draws close to us. Being IN CHRIST is always the answer to every question on every test. So don't fear the quiet. Don't fret when you can't see the answer. The teacher is on your side and encouraging you to trust Him. You will pass this test!